Bursitis of the hip is a common condition that is found in people with degenerative arthritis, athletic injuries, and overuse. The bursa is a small sac that normally contains just a small amount of fluid overlying the hip joint. 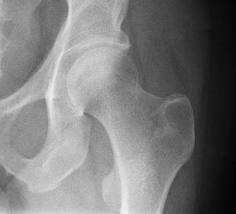 In the hip, there is a large bony protuberance known as the greater trochanter. Overlying this, a large bursal sac known as the greater trochanter bursa overlies it. Its function is to provide a smooth surface so that the overlying muscles in the iliotibial band can glide freely with joint motion. When the bursa becomes inflamed and swollen, pain develops which can be quite severe. Another bursa located on the inside aspect or the groin side of the hip is called the iliopsoas bursa and this also can become inflamed causing hip pain which is more typically located towards the groin. Bursitis of the hip can be quite sharp and intense but may also be described as achy and diffuse frequently. It can be confused with pain arising from other parts of the body. It may be worse at night especially when lying on the affected hip bursa and when getting up from a seated position especially after being seated for a prolonged period and can become worse with prolonged activity such as walking, stair climbing, or repetitive bending such as squatting. Repetitive factors such as overuse, prior hip injuries, associated arthritis, leg length discrepancies, presence of autoimmune arthritic processes such as rheumatoid arthritis or prior surgery in the area all can precipitate the hip bursitis. At times, calcium deposits into the muscles and tendons surrounding the bursa may result in chronic inflammation of the bursitis or bone spurs that directly impinge upon the bursal sac can also produce this. There are various conservative modalities that have been utilized including medications, therapy, use of adaptive equipment such as canes, crutches, or walkers have been utilized to help rest the area. Most patients Dr. Lox notes wish to refrain from any type of surgical intervention. 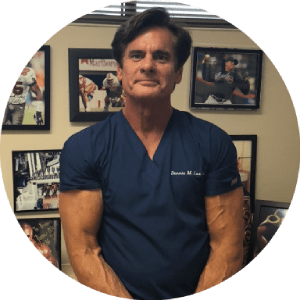 Surgery has been done for underlying arthritis when the bursa is what is really causing the pain and treatment of the bursa effectively can eliminate the need for surgery. Arthroscopic removal of the bursa has been recommended as well; however, successful treatment of the bursa through rehabilitation measures or neuroregenerative medicine techniques such as platelet rich plasma (PRP) or stem cell therapy can eliminate the need for surgery.